Day 5 of the hearing in the Sabarimala Temple entry case witnessed gripping arguments on interpretation of constitutional provisions by veteran Senior Advocate K. Parasaran. Parasaran was appearing on behalf of Nair Service Society, which has intervened to oppose the petition. At the outset, Parasaran dismissed the argument that ban on women entry was misogynistic. He submitted that women in Kerala are socially advanced, owing to their education, and most of them are not opposed to the practises followed in Sabarimala. He added that Hindu communities in Kerala followed matrilineal practises, and hence it was baseless to contend that they are subjugated. Therefore, the issue should not be approached through notions of patriarchy or misogyny. His arguments were in the context of the observations made by Justice Chandrachud and Justice Nariman on day 4 of the argument that women were constrained to accept the practise due to patriarchal conditioning. He refuted comparisons with the horrendous ritual of ‘Sati’, which, according to him, had no basis in Hindu faith. He submitted that Hinduism was by and large tolerant and non-discriminatory, though minor aberrations could be there. He argued that religious traditions are valid on the touchstone of constitutional morality. According to Parasaran, the practise was not rooted in misogyny or patriarchy, but on the character of the deity of Sabarimala, Lord Ayyappa. A deity has its own character and individuality in law. Lord Ayyappa was a perpetual celibate, a “naistika brahmachari”.Referring to portions from “Sundarakanda” of Ramayana, he explained the concept of naistika brahmachari. He also explained that Lord Ayappa was a Yogi, by quoting Adi Sankara. His ‘perpetual celibate’ form, is not only a distinct legal person. but is entitled to the protection of the Constitution. The pilgrims who undertake to visit Lord Ayyappa in Sabarimala have to observe celibacy, and are therefore expected to avoid company of women. During the course of the argument, Parasaran made an interesting analogy, by likening Legislature to Brahma, Executive to Vishnu, and Judiciary to Shiva. Shiva, in his “ardhanareeswara” form symbolised judiciary, as it strives to strike equilibrium and harmony between all elements. The discussion veered towards the ambit of Article 25(2)(b). 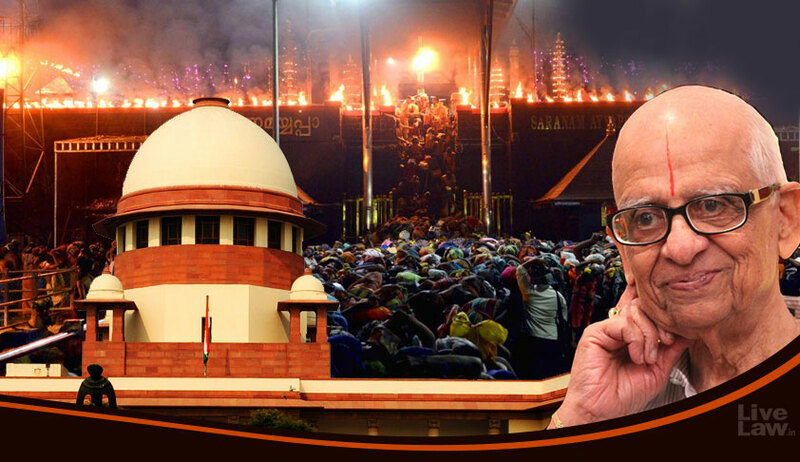 It may be recalled that during earlier hearings, the bench had orally observed that the expression “all classes and sections of Hindus” in Article 25(2)(b) could be expanded to cover women so as to give them access to Sabarimala. Amicus Curiae Raju Ramachandran had also submitted that Article 25(2)(b) was not a mere enabling provision, but granted substantive rights to women. However, Parasaran rebutted such arguments by stating that Article 25(2)(b) was intended only to address caste based discrimination. The specific mention of Hindu religion in Article 25(2)(b) meant that it was aimed at ameliorating discrimination against the lower castes, which were prohibited from entering places of worship. It was his case that if the protection was intended for women, then its language would have made it universally applicable to all other faiths. At this point Justice Nariman asked whether Article 25(2)(b) will cover women belonging to lower castes. Parasaran responded that the basis of the Article was caste and not gender. Justice Nariman seemed doubtful about the soundness of that argument, as he said that Article 17 had already taken care of caste based exclusion and hence there was no need to reiterate the same in Article 25(2)(b). Parasaran’s reply to this was that Artilce 17 was of general application, and Article 25(2)(b) was a specific application with respect to Hindu religious institutions. “Is Article 17 the core of Article 25(2)(b)?”, asked Justice Nariman. Pasaran answered in the affirmative. Further, Parasaran pointed out that “religious institutions” was conspicuous by its absence in Article 15(2), which lists out the public places like shops, restaurants, etc to which access should not be denied on the grounds of gender, religion, caste etc. An attempt to include “religious institution” in Article 15(2) through constitutional amendment did not attain success. Justice Nariman expressed agreement that both Articles 17 and 25(2)(b) dealt with caste based discrimination. However, he asked Parasaran whether Article 25(2)(b) could be invoked on grounds of social welfare and reform to give access to women. Parasaran replied that there was no issue of social welfare or reform in Sabaramila case. He said that the practise was based on the faith of the devotees about the character of the deity. “Courts cannot reform a religious faith out of its identity”, he said. Doing so will infringe the right of the devotees under Article 25(1) of the Constitution. Mr. Parasaran advanced that Article 25(2)(b) could at best be seen as an enabling provision for the legislature to make laws, and Courts cannot act on that. However, he argued that there was no occasion for the state to introduce such a legislation, considering no concerns of “social welfare and reform” are involved. Further, any such law would have the effect of forcefully eradicating a practice rooted in the faith of hordes of worshippers, which in turn would infringe their right under Article 25(1) to freely profess, practise and propagate their religion. He referred to apex court judgment in Ewanlangki-E-Rymbai v. Jaintia Hills District (2006) 4 SCC 748, where the constitutionality of Section 3 of the United Khasi-Jaintia HillsAutonomous District (Appointment and Succession of Chiefs and Headmen) Act, 1959 was upheld. The provision entitling only members of specified clans to contest the elections to the District Council, excluding those of the Christian faith was not found to be in contravention of Articles 14, 15 and 16. “Over activism will create a ‘thrisanku heaven’”, he quipped in the meanwhile, alluding to the myth that the attempts of Viswamitra to build a heaven ended furtively as it happened to be in middle of earth and heaven, hanging in the middle reaching nowhere. Before concluding, he mentioned that he had otherwise stopped accepting new briefs and had taken up this case only out of his love for constitutional law. The arguments will continue tomorrow, with V.Giri, Senior Advocate, arguing on behalf of the Thantri, the chief priest, of the temple.